Posted in: adventure, comics, Fantasy, Gamebook, Gamers, gaming, Readers, Reading. 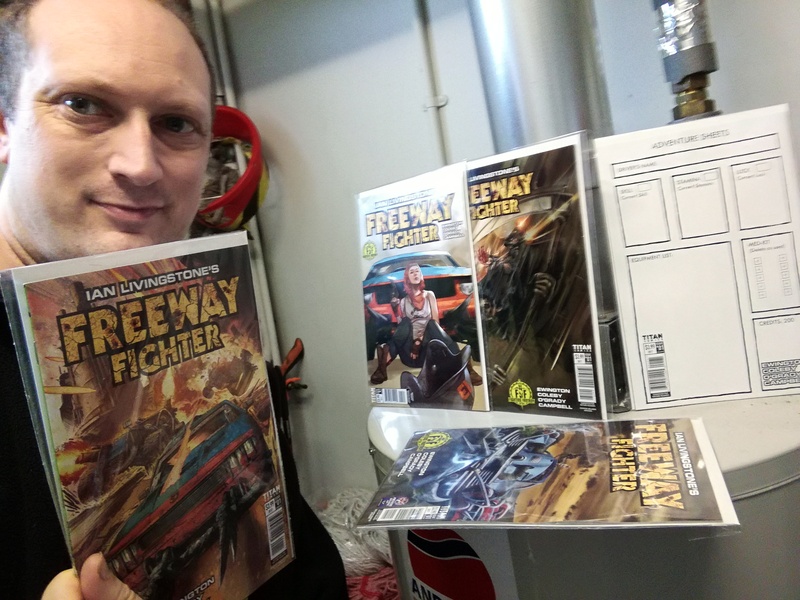 Tagged: andi ewington, freeway fighter, Ian Livingstone, Len O'Grady, Simon Coleby, Titan Comics. This week was a tremendous one for Fighting Fantasy fanatics like myself. Andi Ewingtons comic version has had issue one released, a bunch of which (there are several covers) arrived to my workplace the other day and I managed to snap this brag pic. So how has it turned out? In one word, fantastic! The comic is true enough to the gamebook published in 1985 and focuses on the post apocalyptic life of an ex car racer. Society has collapsed and vicious road thugs and motor gangs haunts the highways. Even this first issue has a couple of lovely Easter Eggs draughted in to the frames by the ultra talented Simon Coleby, and Len O’Grady on colours. I hear there are 5 of which I think I have spotted 4 (I refuse to do spoilers at this early stage). The first issue is basically about setting the scene and characted development. We get to see just how rough the world has become and it leaves you on a cliff hangar ending ready for issue 2. My only blast is it ended too soon for a monthly comic. It needs a couple more pages in it. The front of the book also contains a foreward by Ian Livingstone CBE himself pictured below with an equally handsome Me. He writes about his inspirations behind the book and why he wanted to go more futuristic with book 13 in the Fighting Fantasy book series when his usual mediums are sword and sorcery epics. Current production is at the cover art for issue four stage so if you love a good post-apocalyptic yarn, get on over to forbiddenplanet.com and order your copies TODAY! Pro’s – good production team delivering polished material on time. Con’s – bit too thin for a monthly comic. Half a dozen more page sides should do it.